Over 27,000 bumpers repaired since 1989. 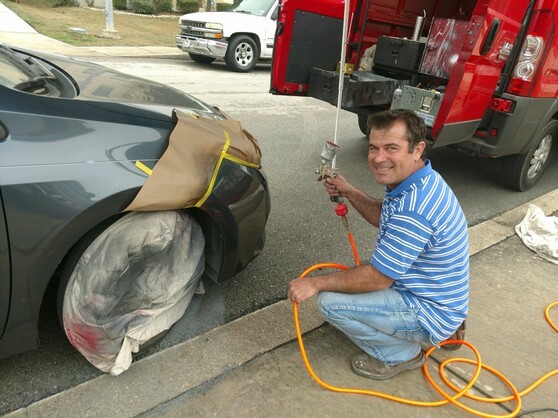 Express Bumper Repair has been repairing dents, scuffs, scrapes, holes, and punctures in automotive plastic bumper covers, wheel well moldings, spoilers, ground effects, and mirrors since 1989. We are specialists in a technology known as S.M.A.R.T. (Small Area Repair Technology). Our purpose is to keep your vehicle in pristine visual condition without conventional time consuming and expensive methods. In most cases the average repair costs less than your insurance deductible. We come to your home or office, and our van contains a complete custom paint shop to perfectly match your factory finish. Call 210-825-6355 for an appointment. North Central: Castle Hills, Castle Hills Forest, Churchill Estates, Deerfield, Deer Hollow, Encino Park, Hidden Forest, City of Hill Country Village, City of Hollywood Park, Hunters Creek, Inwood, Oak Meadow, Park Forest, Redland Woods, Rogers ranch, City of Shavano Park, Stone Oak, Timberwood Park, Vance Jackson Assn., The Vineyard, Woods of Shavano, Canyon Springs, Green Spring Valley, Huntington Place, Sante Fe, Bluffview. North East: Dover, Falcon Ridge, Knoll Creek City of Live oak, Meadowbrook, Northampton, Olympia hills, Santa Fe, Steubing Ranch, Towne lake, City of Universal City, City of Windcrest, Ventura, Gardens of Greater Woodlake, Hunters Mill, New Braunfels, Dove Crossing. North West: Arbor at Sonoma Ranch, Braun Station E., Braun Oaks, Bridgewood, Creekside, Crown Meadows, City of Helotes, Lindsey Place, Mainland Square, Northwest Crossing, Oak Bluff, Oakmont Downs, Parkwood, Sedona, Sierra Springs, Stonefield, Sunset Vista Tanglewood, Wildhorse, Woodridge, Balcones Heights, Cedar Springs, Oxbow, College Park, Misty Oaks, Stanton Run. Inside Loop 410: City of Alamo Heights.